Landscape design is the beginning of the landscaping process, and sets the tone for the whole project. Most people are not visual in nature and struggle when a contractor or designer starts his presentation of ideas with words and gesturing his hands to explain a vision. That is where a landscape drawing will explain in pictures a designer’s vision. It bridges the gap between words and actual visualization, allowing the customer to see what is being proposed. It starts with the ability of a designer or architect to envision the possibilities, and blend this vision with the customer’s needs, the existing site’s layout and features, and to work all of that into the available budget. 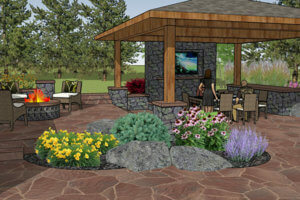 The landscape design process is challenging and requires someone with natural abilities and experience. Landscaping and landscape design in the mountains of Colorado require a particular level of skill. Often sites require the installers to access difficult locations and having the experience to envision the possibilities in this type of landscape takes natural talent and also years of working experience to develop. Evergreen Landscape & Design specializes in the challenges of a Colorado mountain landscape. We have been designing great outdoor living spaces in Evergreen Colorado and the surrounding communities of Conifer, Golden, Morrison, Genesee and the Denver Metro for 15 years. Our ability to design outdoor living spaces in even the most difficult terrain sets us apart from the competition. In fact, where most designers see difficulty with mountain landscaping, we see opportunity. A landscape with more terrain can often create more interesting design elements such as retaining walls, large boulders to bridge grade changes, or creating multiple levels in the landscape, all provide opportunity for a more unique landscape design. Evergreen Landscape & Design pays particular attention to the customer’s desires and we design a Colorado landscape to fit you and your lifestyle. Too often, landscape designers make the mistake of not listening well enough to the customer during the design phase. We do not make this mistake and take pride in our ability to first listen to the customer, and then apply our years of experience into a customized landscape design that fits your budget. After all, the design process is only the beginning of the artistic process. Its starts with a great design and then goes to the true and most valued artists, those responsible for the installation of the landscaping. The best landscape drawing is still just a drawing. What plays out well on paper sometimes doesn’t work as well when being installed. Landscape design shouldn’t be seen as absolute or perfect. On most projects there will be some alterations to the plan. As things are installed it becomes evident that something should be a little bigger, or we need another boulder, or why don’t we add more patio space or curve it slightly more this way etc…When the landscape hits the ground is when the true art is revealed. While a great landscape design is critically important, it is those who do the landscape installation that should get the bulk of the artistic credit!